Black antiqued celtic knot wedding band ring. 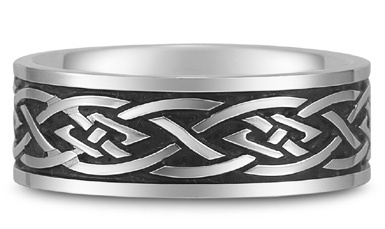 Celtic knot designs are continuous around the band. Band weighs approx. 12.0 grams (weight based on size 10, will vary slightly based on size). Also available in yellow gold by request, 18k gold or platinum, shown below. We guarantee our Antiqued Celtic Knot Wedding Band to be high quality, authentic jewelry, as described above.